The Thanksgiving struggle is real: finding room for that massive bird in your crowded fridge, making sure the crescent rolls don’t carbonize in the oven, heading back to the store for the third time because you forgot the jellied cranberry sauce. If skipping all the prep and cleanup sounds tempting, you’re in luck, because there are plenty of highly skilled restaurants in L.A. willing to do the hard work of Thanksgiving for you. So toss away that apron and pick up the phone instead: here’s where and how to order anything from whole turkeys to creative side dishes to show-stopping desserts. apple-almond crisp and chocolate-bourbon banana cream pie for dessert. Order Deadline: November 19, 2 p.m. Pick-Up Time: November 21, 3-9 p.m. Chef Duke Gervais of Little Tokyo’s Baldoria is offering a host of side dishes in two sizes, “medio” (serves 6-8) and “grande” (serves 10-15). Feast on options like spicy Brussels sprouts, brown butter smashed potatoes, Texas jalapeño cornbread, maple-roasted squash and hazelnuts, and truffle 4-cheese mac ($18/$30). Order deadline: November 19, 6 p.m. Pick-Up Time: November 22, 11:30 a.m.-4 p.m. This boutique butchers shop’s “Luxegiving” package doesn’t come cheap—it’s priced at $759.95—but it sure does come with everything you’d need for a blowout meal. Feeding up to 14 guests, the spread includes a ~20 pound organic, roasted turkey paired with sides of sweet potato gratin with crème fraîche, green beans with roasted mushroom, mashed potatoes, house-sausage stuffing; cranberry sauce, gravy and dinner rolls, plus a pumpkin pie and pecan pie. potato galette, tzimmes, apple and bitter greens salad, and gravy). You can also pick up if a whole guava cheesecake or pumpkin spice custard cake if you’re feeling something sweet. Pick-Up Time: November 22, 10 a.m.-2 p.m. This newly-debuted, all-day café has the all classic sides you might need for Thanksgiving (no turkeys though). 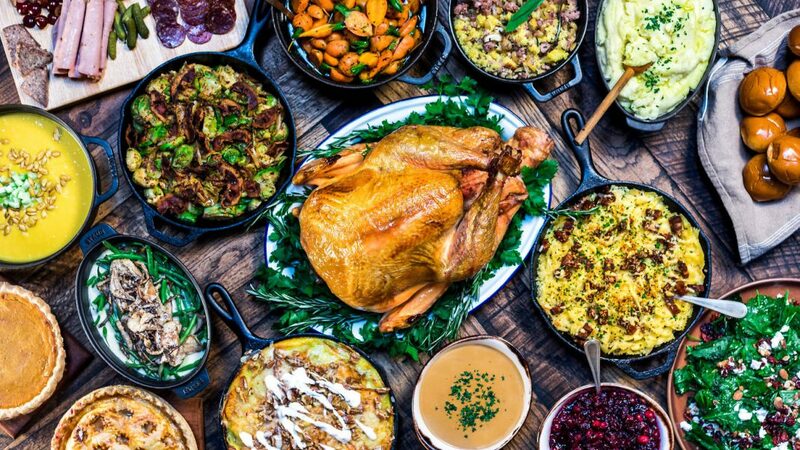 Options include sausage-and-chestnut stuffing, roasted Brussels sprouts with bacon, mac and cheese, maple-glazed sweet potatoes, plus sweets like apple-cranberry cobbler. Each side dish serves 8-10 peoples, and prices range from $15–$42. Order Deadline: November 16, 5 p.m. Pick-Up Time: November 20, 4–7 p.m.; November 21, 9 a.m.–8 p.m.
Zoe Nathan and Erin Eastland are bringing the holiday spirit per usual at their Santa Monica restaurants, offering both traditional comfort foods and Huckleberry signature dishes. This year’s menu includes turkey with cremini mushrooms gravy or red-wine braised brisket, paired with side options like chimichurri roasted carrots, wild rice salad, and smashed Yukon Gold potatoes. See the menu here. Order Deadline: November 15, 5 p.m. Pick-Up Time: November 22, 9 a.m.–noon. Both locations of Suzanne Goin and Caroline Styne’s the Larder are offering take-away Thanksgiving items this year, including a complete turkey dinner with all the fixings that serves eight for $75 per person. You can also pick and choose from a laundry list of appetizers, sides, breads, desserts and even wine-bottle packs if you feel like putting together a customized holiday dinner or party. Order Deadline: November 18, 5 p.m. Pick-Up Time: November 21, 10 a.m.–6 p.m., and November 22, 8–11 a.m.
L.A.’s iconic beef specialist Lawry’s is offering ready-to-serve prime rib and turkey for the holidays, which can be purchased à la carte or as part of a meal package. The sides offered include all the goodies you usually see rolling around on that silver cart: creamed spinach, mashed potatoes, whipped horseradish, creamed corn, cranberry sauce and cornbread stuffing. They’re also offering Yorkshire pudding batter, in case you want to trying making the restaurant’s over-crisped delights at home. Pick-Up Time: November 22, 11 a.m.–4 p.m.
Los Feliz favorite Little Dom’s is offering whole deep-fried turkeys (for a very resonable $80), brown butter pumpkin and bourbon pecan pies, and sides like fennel Sausage stuffing and shaved Brussels sprouts salad, all available for pick up on Thanksgiving morning. If you plan on reserving one of those crackly fried turkeys, though, better call soon—supplies are limited. Pick-Up Time: November 22, 9–11 a.m. This Culver City BBQ joint is offering wood-smoked, all-natural, free-range, unsliced smoked turkey breasts to spice up your holiday dinner (they already sold out of the whole turkeys, believe it or not). Fortunately, the spread of Southern-style sides is just as captivating as the main event: cornbread-and-sausage stuffing, buttermilk biscuits with whipped honey butter, roasted Brussels sprouts, braised greens, and pimento cheese with crackers. Pick Up Time: November 22, 11:30 a.m.–3 p.m.
You’ll find crowd-pleasing Thanksgiving take-out options at both the Venice and El Segundo locations of Superba Food + Bread, include many sides which can be made vegetarian or dairy free upon request. Snag a rosemary-honey-brined turkey for $120, or mix and match your meal with sides like green beans amandine and white cheddar mac and cheese. Order Deadline: November 18, 4 p.m. Pick-Up Time: November 22, 10 a.m.
Micah Wexler’s new wave deli is swapping out the pastrami and lox for smoked turkey this year, offering an complete 10-to-12-person dinner for $350 that includes a whole smoked Mary’s Organic turkey, challah stuffing, gravy, roasted carrots, goat cheese and apple salad, squash soup and “cheezy” pull-apart rolls. Add on a whole pie (pumpkin with toasted marshmallow or brown butter pecan with cocoa nibs) for $40. Order Deadline: November 19, 5 p.m. Pick-Up Time: November 22; delivery available. Meal packages at this Southern-inspired spot in the Beverly Center start at $99 and include roasted turkey plus mashed potatoes, jalapeño cornbread stuffing, green bean casserole, bourbon-glazed yams, cranberry relish, biscuits, and giblet gravy.